We have two new recipes added to our site that I just wrote about in my guest blog post on lentils for Girl Power Hour. The recipes take advantage of two great spice blends. 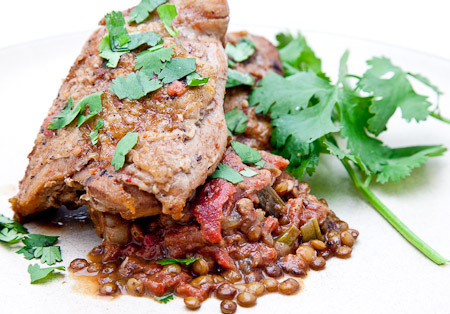 Garam masala is used in the Braised Chicken with Lentils and Yogurt, and the Spicy Red Lentil Stew gets its kick from berbere. Lentils are such a great ingredient to work with becuase they give you all the great nutriton of beans, but cook in the time it takes to make rice. If you are looking for some hearty dishes to cook as summer winds down, I hope you’ll give these a try. 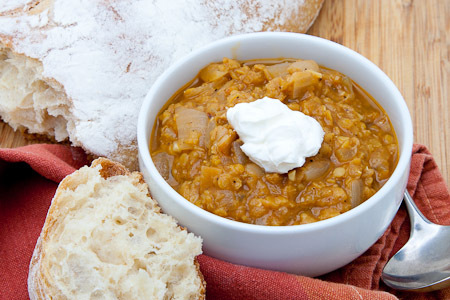 The Spicy Red Lentil Stew is quick and easy to make and costs less than a dollar a serving! Tags: berbere, garam masala, lentils This entry was posted on Wednesday, September 15th, 2010 at 12:40 pm	and is filed under Cooking on a budget, So Edible Blog Posts, Soups & Stews. You can follow any responses to this entry through the RSS 2.0 feed. You can leave a response, or trackback from your own site. They both look great, but the braised chicken looks like something my family would love. I’ll try it out!